We are proud to announce that Kreano Journal has become a partner of AMLI (Asosiasi MIPA LPTK Indonesia) as publication venue. 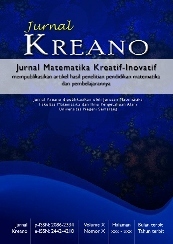 Since Volume 6 Number 1, June 2015, Journal Kreano has new cover and Layout. By SK PDII LIPI, Journal Kreano also implementing online business since then. We suggest author, and reviewer to do online business through Open Acces Journal System. So that, editor only serve for cover request. Due to tchnical problem on our server, we beg you a pardon for late publication of Vol 8(2) December 2017.